Anzacs went to Gallipoli and exposure to incompetent British generals and a determined Johnny Turk. Evacuated to Egypt, they would once more face incompetent British generals and a determined Johnny Turk as they crossed the heated sands of Sinai. The troops continually faced the hesitancy of the British War Office—until Allenby. After devastating failures at the Dardanelles, Kut in Mesopotamia, and stalemate in France, British morale was "rock bottom" while Turkish morale was "stratospheric". Moreover, in defending the Suez Canal, General Murray split his forces into smaller, isolated pockets forward of the canal, thus ensuring that they would be defeated—until the appointment of Henry Chauvel. General Henry Chauvel, an Australian, became "commander of Anzac, British, and dominion soldiers, the first non-British officer ever to do so." This was "an unheard-of honor that horrified traditional caste-conscious relics of the empire." The battle of Romani would be the first bright spot in 1916 for British arms, after which the combined forces chased the Turks east into Beersheba and Gaza, on to Palestine and Jerusalem. Then, in 1918, after two failed "raids" across the Jordan River (More than "raids", these were failed campaigns, whitewashed for the War Office), and coordinating with the Northern Arab Army, Amman was captured. 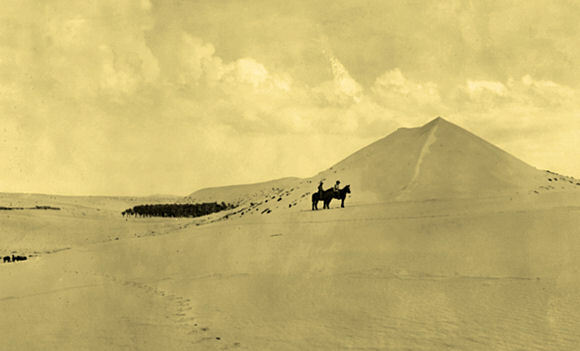 A three-pronged attack, including "the great ride", "the greatest cavalry operation of all time,", or "the greatest mounted ride in history", by nearly 30,000 horsemen of the Desert Mounted Corps, faked out the Turks and ensured victory and a northward chase to Damascus and beyond. The spoils were 75,000 prisoners (Turkish soldiers along with numerous Germans, including staff officers), more than 360 guns, 800 machine guns, 3,500 transport animals, rolling stock, trucks, a wagon loaded with gold and silver, plus other booty. This three-week operation was the culmination of three years of work in which the Suez Canal was saved, major contributions were made to the Arab forces and their support of Sharif Hussein's revolt, the Holy Land was reclaimed after 730 years of Muslim control, and a springboard was provided for victory in the west. The Sinai campaign "showed that Australians and New Zealanders continued the spirit of mateship, pride and national identity, begun at Gallipoli." However, while praising the "other ranks" and many of the lesser British officers, the author is devastatingly firm in his disdain for most senior British officers until Allenby. After all, he IS Australian. Hi - we follow your blog and was curious to know if you may be interested in a contribution post for your readers. Please consider it and let me know if it is something you are open to. Thanks! This sounds like a very useful book. And a very entertaining review.